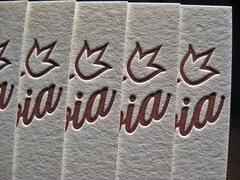 Get a 3D look at these letterpress cards in this stereoscopic photo. Now that we have a setup to take 3D photos and edit them, we’ve been experimenting more with it. To see in 3D above, cross your eyes until the photos overlap and then focus on the image. 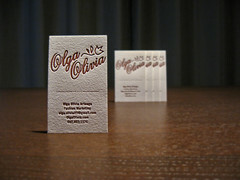 If you do it right you’ll see a perspective shot of the business cards, it turned out pretty cool! 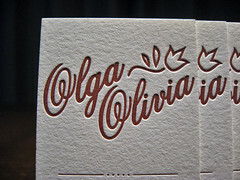 We didn’t post these cards for the 3D photos alone, we wanted to share them to show off a 1-color design by Olga of Olga Olivia. 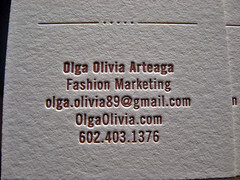 Olga designed these cards for her fashion markting business she started 3 years ago in Arizona. 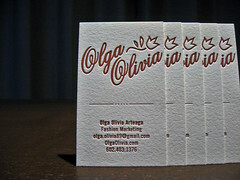 We printed the business cards on cotton paper (110lb Crane’s Lettra) in a pearl white color. We custom mixed pantone 506U for the one-color print (maroon). 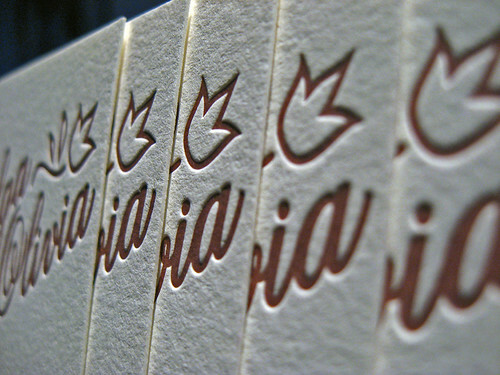 With letterpress, it’s important to focus on the design and layout. 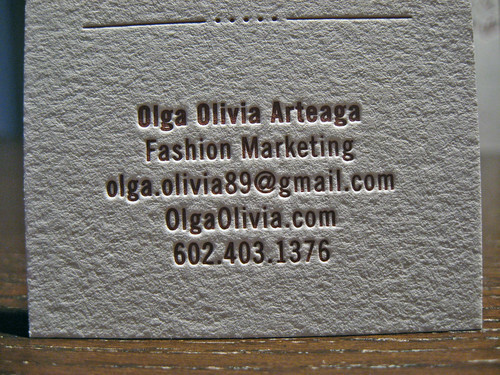 Just because a business card is one-color doesn’t mean it has to be plain. Instead of using color to direct focus, the designer has to think more carefully about font choice and styling as a way to drive your eyes to the most important areas. 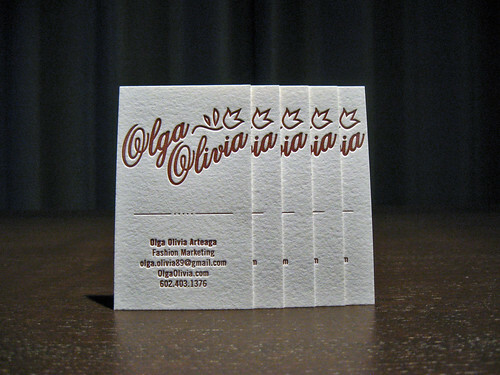 This card had a mixture of big and small type and because Olga chose to go with a larger card (3.75″ x 2.25″), she had more room to play with. 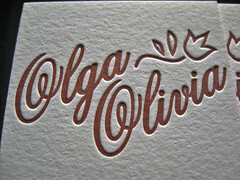 The floral vector helps to make the script feel more like a logo, and set it apart from the contact information. 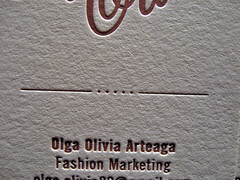 To achieve a nice solid coverage we skip-fed (double inked) the business cards on a Heidelberg Windmill. 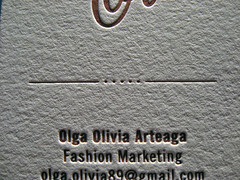 Olga kept it simple with the contact information which helps make it easier to read. All in all the card turned out really nice! 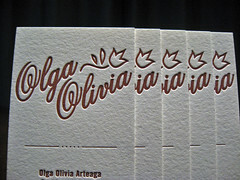 A simple design with some embellishments helps to highlight the letterpress technique and highlights the impression of the design into the paper. Below is one last 3D photo, not as good as the one at the top of the post but still pretty neat. 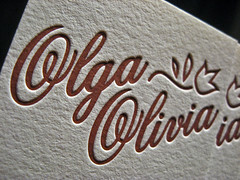 For more information on our letterpress work you can email (contact@dolcepress.com) or call us at the studio. We’re always happy to talk about a project and give our technical or creative advice. If you’re in the neighborhood (Long Island) and want to stop by to see samples of our work, give us a call to setup an appointment.